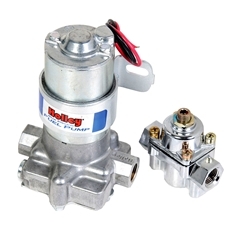 This electric fuel pump provides constant fuel flow with no pulsation. It has an externally accessible relief valve. The rugged pump design is highly tolerant of contaminated fuels. Not for use with alcohol or methanal fuels. Pre-set at 14 PSI. Includes mounting bracket and high pressure regulator.